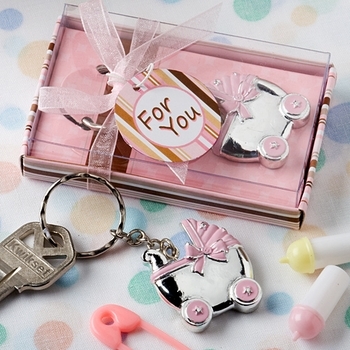 This baby girl shower favor features a poly resin, pram shaped charm with a bright silver finish and pink accents. The pram charm measures 1 1/8 inches and 3 inches including the key chain. Each one comes with a clear topped box tied with a pink bow and an attached "For You" tag. Please note: The "For You" tag seen above cannot be personalized. Custom Tags or Stickers can be purchased ($.35 each) for you to add an extra special touch to each of these key chains!